Al-Shabaab fighters have last night attacked government military bases in Bal'ad town which lies 30 KM north of the Somali capital Mogadishu. 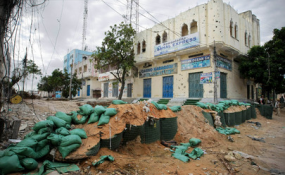 The local residents said the ambush attack prompted hours of heavy fighting between the Somali army and heavily armed Al-Shabaab fighters. There are a variety of casualties on both sides, although it is unclear exactly what the official casualties are. Residents reported they heard loud explosions and gunshots as Al-Shabaab fighters attacked a military base in the town. Al-Shabaab has claimed it seized briefly parts of the town and burnt down several battle wagons. The group is carrying out hit and run attacks in major towns under government and deadly explosions in the capital Mogadishu.